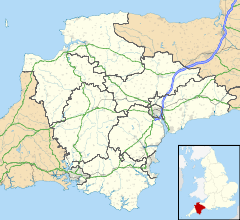 Offwell is a village and civil parish in East Devon in the English county of Devon, approximately 2 miles south-east from the nearest town, Honiton. Offwell can be accessed by the nearby A35 road. Offwell is a small village with a primary school and a post office. The village sits next to the Offwell woodland, which has its own wildlife trust. The medieval church of St Mary has a chancel arch, one chancel window and a south doorway which date from c. 1200. There are a west tower, a north aisle and a north chapel. Features of interest include the early 18th-century pulpit and reader's desk, the Lord's prayer and creed mural painting, and some Jacobean carvings. Offwell House, built in 1830, was the residence of Bishop Copleston. The Copleston family arrived in the parish in the late 18th Century and provided many of its Rectors from 1772 to 1954. They transformed the village and parish with their generosity and influence. Because of the complexities of its medieval past, Offwell had no Lord of the Manor and so the church was the focus of authority. This authority was wielded not only by its Rectors, who varied greatly in their commitment to the parish, but also by its landowners who served as churchwardens, and sometimes as overseers of the poor, by rotation. Offwell is the home parish of Colwell Wood, a small estate lying to the west of the village. There is only one property situated there, a seemingly insignificant cottage known as Colwell Wood Cottage. This property and the land around it, have links with some of the most powerful landed families in medieval England, with a Napoleonic war hero and a King. As a small estate Colwell's history can be traced back to the Domesday Book. As a small part in much larger estates it passed through the hands of the great aristocratic families of de Courtenay, Hungerford and Hastings. During the Wars of the Roses, and the period of Yorkist rule between 1461 and 1485, it was held by the ill-fated Richard, Duke of Gloucester, who finally became King Richard III. Thereafter, the dual functions of Colwell Wood can be traced more readily. It firstly remained an asset due to its timber and cover for breeding game birds, and secondly it was a tourist retreat. In 1985 Colwell Wood was acquired by its current owner who has funded research into its history, restored the Cottage, and striven to preserve its tranquillity and natural environment. Wikimedia Commons has media related to Offwell. ^ "Conservation". Retrieved 21 January 2017. ^ a b A History of Offwell Church and Parish, Devon. http://debrettancestry.co.uk/productdetails.php?prodid=2: Debrett Ancestry Research Ltd. 2009. ^ A History of Colwell Wood and Cottage. https://www.amazon.co.uk/History-Colwell-Wood-Cottage/dp/1535099143: Debrett Ancestry Research Ltd. 2016. ISBN 978-1535099141. This page was last edited on 29 January 2019, at 04:10 (UTC).